The day started sunny with a blue sky and white clouds. This was too good to be missed so we hurried out to the bus stop and made our way to London Bridge. As usual, I bought baguettes and coffee for breakfast while Tigger entered into negotiations with the ticket machine. The Brighton train took us to Gatwick, passing without stopping through Horley, our destination for yesterday’s courier run. There we boarded the train that would deliver us to the ancient Sussex town of Lewes. It has been a while since we last came here and high time to a return to this picturesque town. During the journey, to our dismay, the sky to the west took on a dark leaden aspect and the clouds joined overhead to blot out the sun. The only hope was that we would run through this belt of rain clouds to better weather on the other side. By the time the train stopped to divide at Haywards Heath, we were in sunlight again but there were still dark clouds to the west with a clear rainbow overlying them. 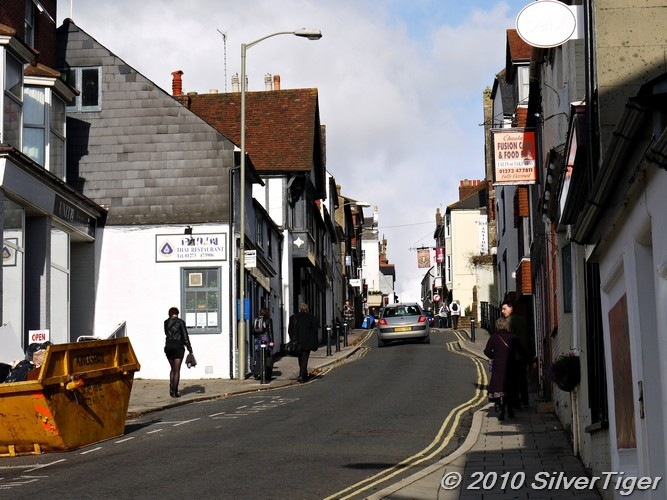 The sun was shining when we reached Lewes and walked up the hill from the station to the centre. At the top, I always stop and look down the High Street because you can see the green country beyond, and sheep grazing, something you cannot do in London. 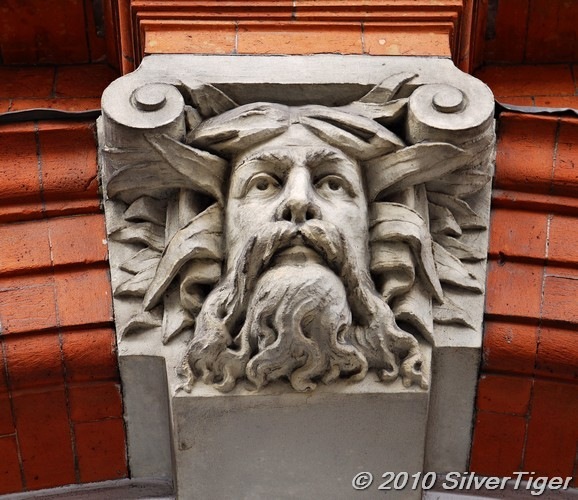 We turned west along the High street and walked its length, revisiting favourite landmarks. 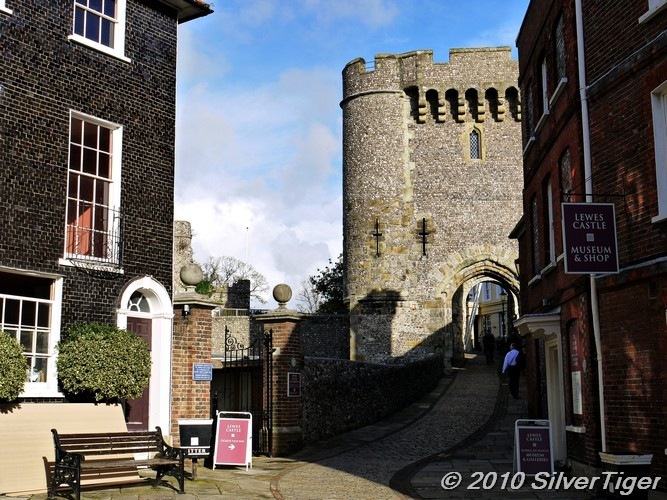 Lewes has a Norman castle which stands upon and artificial mound but we did not visit it today. That is a pleasure for another time. 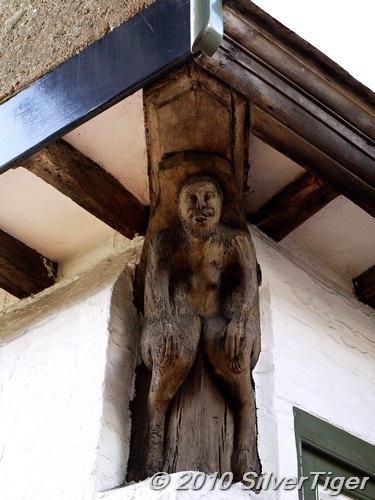 The figure above is perched under the eaves of Bull House which dates from about 1450. The house is associated with, among others, Tom Paine, who lodged here in 1768-9. This ancient building houses the appropriately named Fifteenth Century Bookshop. 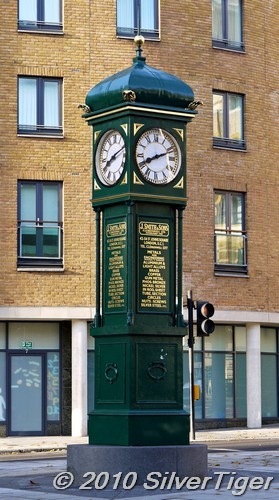 The nearby St Michael’s church has this splendid clock which projects over the road. 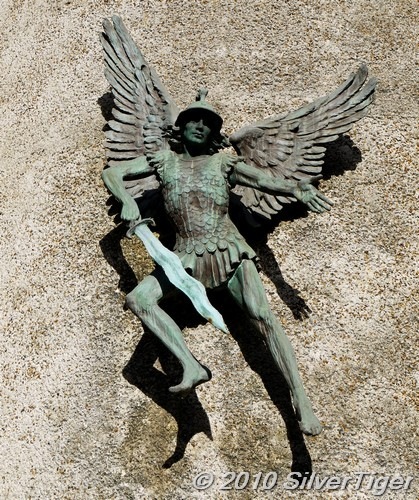 It also has this rather camp-looking angel St Michael, prancing with a wavy sword. 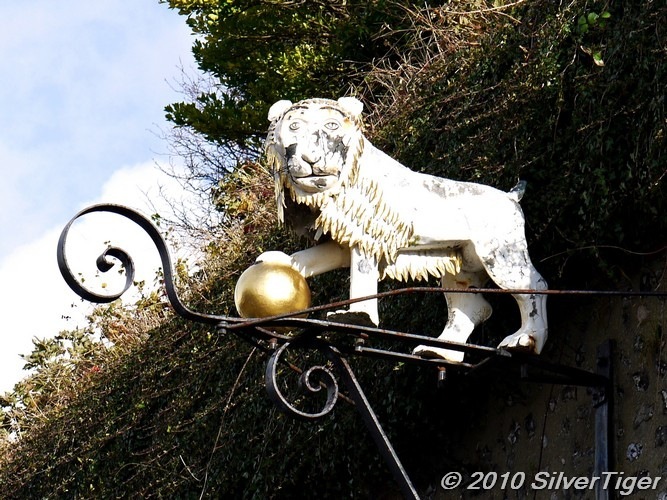 In a car park, there is this slightly sad-looking white lion, the sign from a pub of the same name that once stood near this spot. I have no idea how old the sign is. At the Town Hall, the Registry was having an open day, so we were invited in. 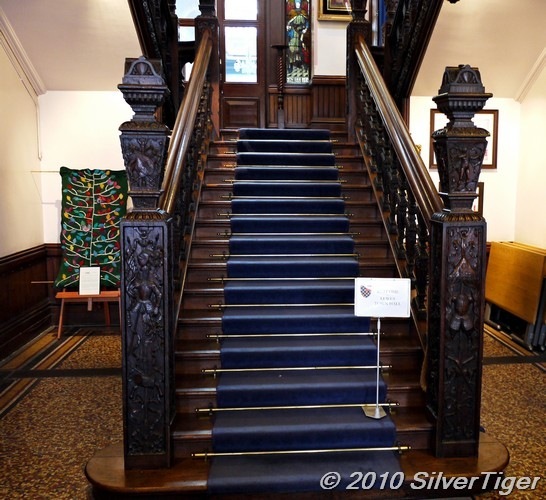 Though small, the Town Hall is a little gem and has, among other features, this Jacobean staircase. 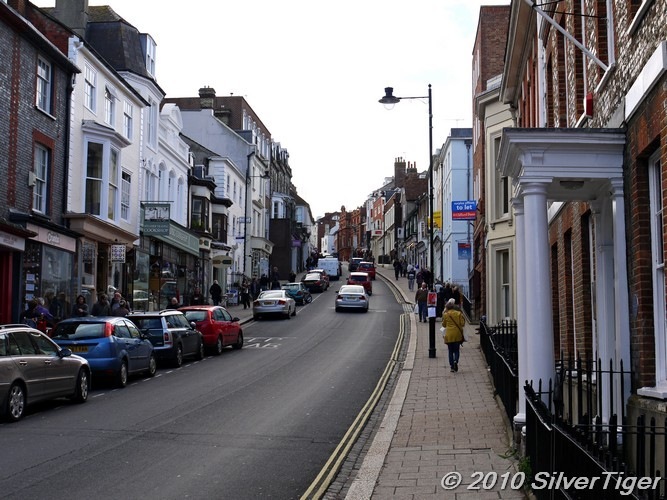 There are plenty of antique shops and markets in Lewes, as one might expect. 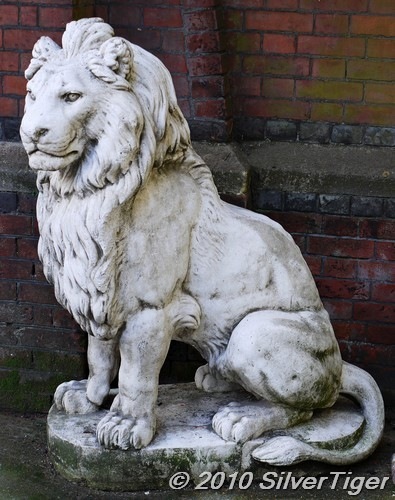 We didn’t visit any today but I spotted this handsome seated lion outside one market. I would have liked to rescue him and put him in our garden. 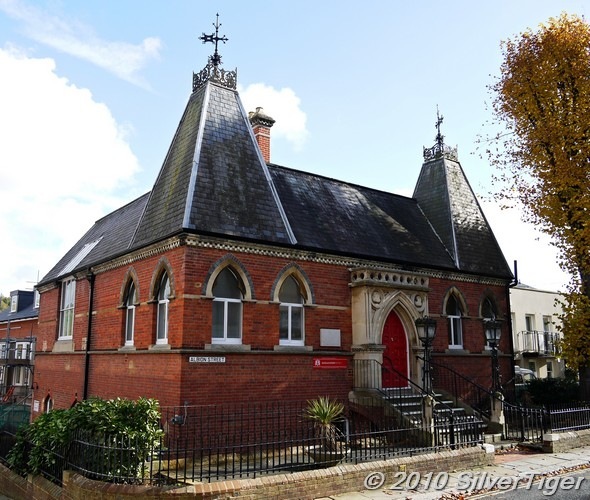 This pretty little building is the Old Library in Albion Street. There are a lot of buildings in Lewes whose names are prefixed by “Old”, as is only natural in a town of its age and vigorous history. 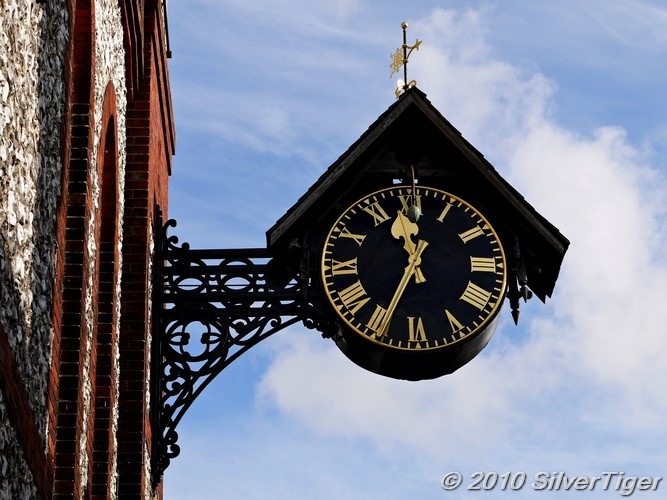 Unlike many another ancient town, however, the passage of time has treated Lewes fairly kindly. There are no garish modern buildings to disturb the general elegance of the place. We had lunch at PizzaExpress at the bottom end of the High Street. Then we worked our way slowly up the hill back towards the centre. In the above photo, can you see the street lamp and that there is a pink-coloured noticed attached to it? 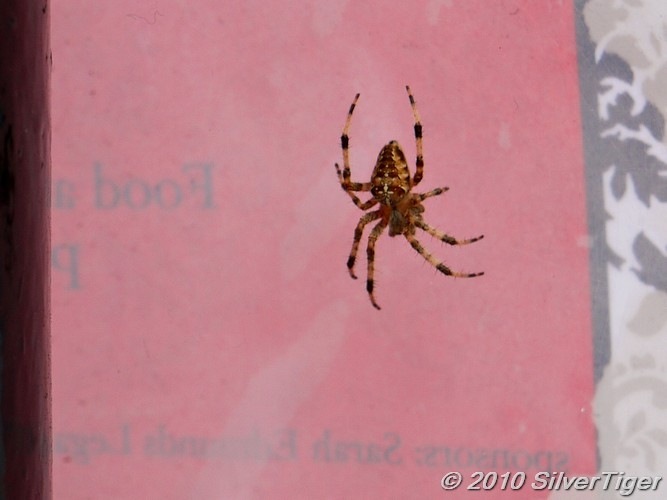 This is what I found on the other side of that notice, a rather splendid spider. We continued up the High Street to the top, the point marked by the war memorial and then turned down the hilly Station Street towards the station. 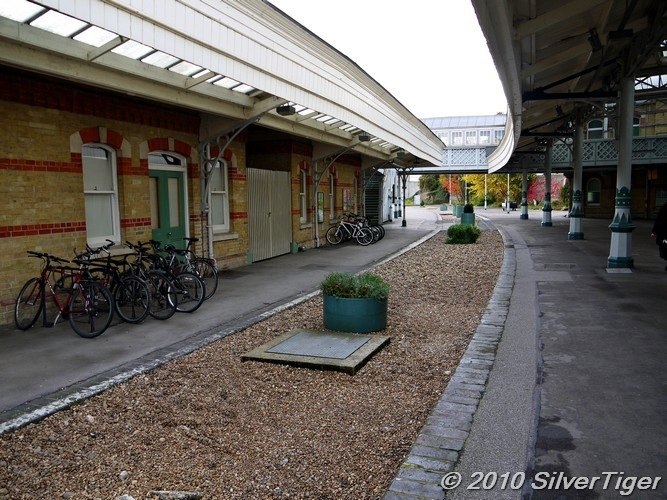 Lewes station has a curious feature, this railway trackbed that has been filled in. I am told that what appears to be one station was once two, built by two rival railway companies. When the railways were nationalized, the stations were combined in one. Perhaps it was then that this track, with its attendant platforms, was found to be redundant and was filled in. We very soon had a train back to London, this one taking us into Victoria, in a repeat of yesterday’s journey. We caught a number 73 bendybus back to the Angel. Because it was Saturday, London’s streets were jammed with traffic and the bus ride home took us almost as long us the train ride to Lewes had done in the morning. 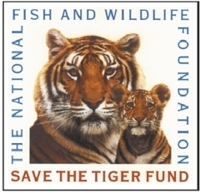 Copyright © 2010 SilverTiger, https://tigergrowl.wordpress.com, All rights reserved. 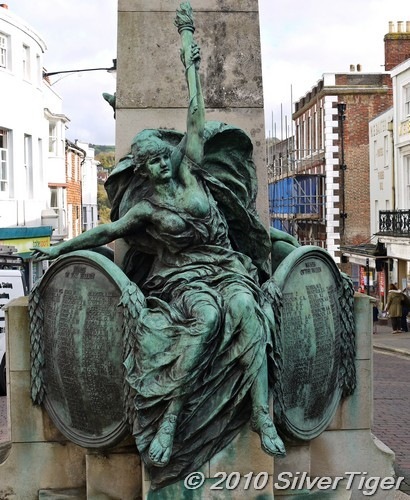 This entry was posted in Travel and tagged Lewes. Bookmark the permalink. My husband would love to go into that old bookstore. Our favorite bookstores here are used bookstores, both for the prices and the gems one can find within. This is a good example of the genre with a wide range of books and ages. Wouldn’t I just love to live in a town that had a castle up the street! Great picture looking down the high street at the green hills. Dibs on the Jacobean staircase. I’m having it transported to my “other” dream house — an “olde worlde” country retreat. I agree with you about the lion. It is a lovely piece of sculpture. It’s going in the “dream” walled garden. What an interesting and colorful spider. Hard to get a feeling of its size, though. 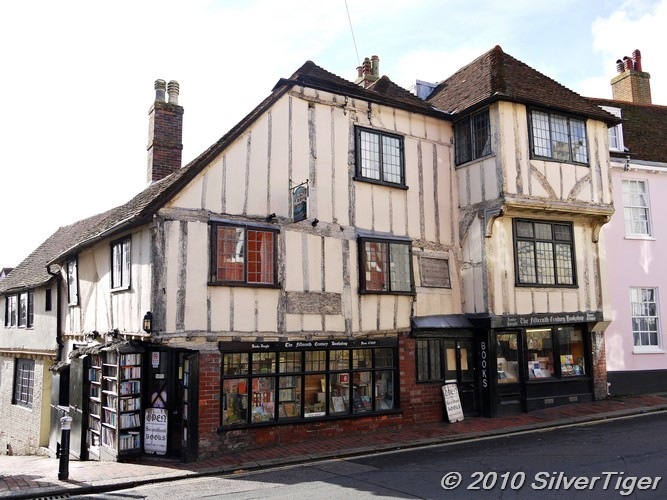 A half timbered 15th century bookshop! I think if I ever got into that bookshop, you’d have to drag me out by main force. I like Lewes. I hope you go back there. I’d like to see more of it. 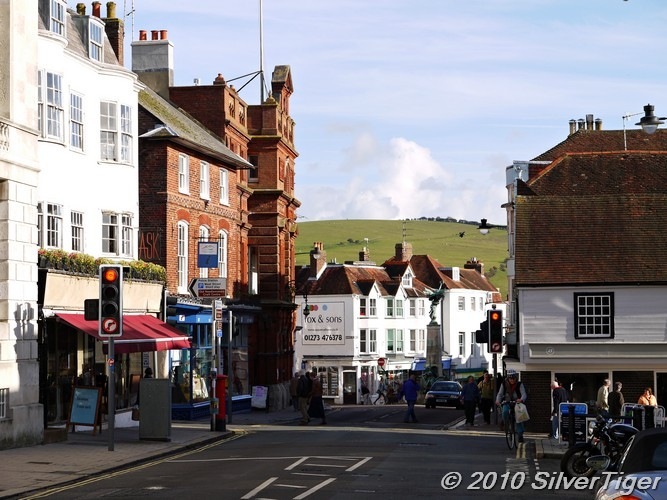 Lewes is certainly a picturesque town and one with a history that adds to its interest. The spider was quite a big one and I think the body was about three-quarters of an inch long. I am sure we shall return to Lewes again and take more photos.